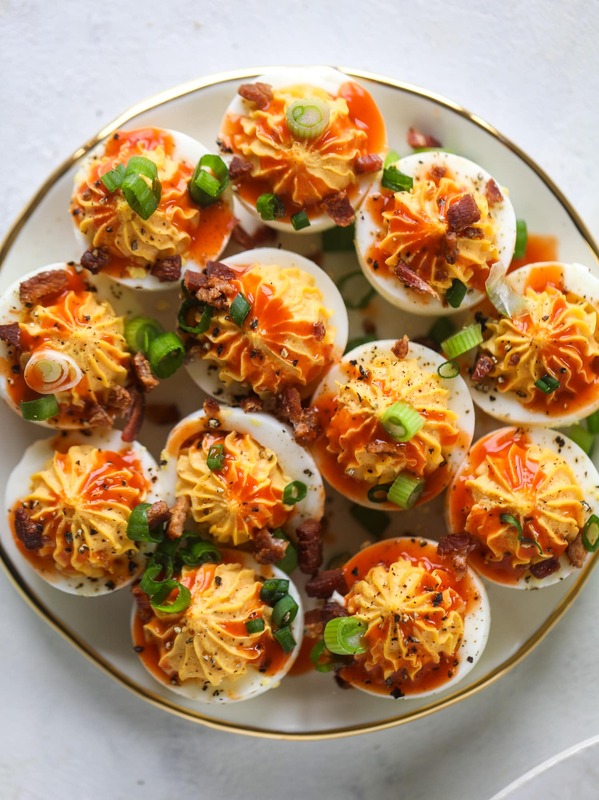 Say heeeeey if you want to put bacon on your buffalo deviled eggs! My goal was to buffalo wing my deviled eggs. AND IT WORKED. However, I wanted to do more than just that. I wanted an incredible savory combo that had a bit of texture. I wanted a deviled egg that we couldn’t stay away from. I realized this year that I have an annual deviled egg tradition! First, I’ve never really planned on it and haven’t felt the need to share a new recipe every year. But then I realized I’ve shared three amazing deviled egg recipes in the last four years. So of course, the pressure was ON. The pressure IS on. If my recipe brain is working, that is. Lucky for us, it was! Okay so I did NOT expect to love these deviled eggs as much as I do. The goat cheese adds this extra creaminess to the filling. The buffalo wing sauce (this is my fave) adds a bit of heat. The bacon adds… well, the bacon. Crunch! Saltiness! All around desirability of course. Not to mention, the regular old deliciousness of deviled eggs. All these exclamation points are necessary, by the way. As a result, these are a savory lover’s dream. They have a reeeeediculous amount of flavor. If you’re on board with the let’s-buffalo-wing-all-the-things craze, then you’ll love it. Bacon blue deviled eggs with asparagus! Toasted sesame sriracha deviled eggs too! All surprisingly fantastic. And now we can add buffalo deviled eggs to the mix! There’s a little something for everyone. In case you want to provide variety. Oh my word. I am such an egg freak (especially because at the moment, eggs are my favorite food. Out of all the foods!) that these just speak to me. 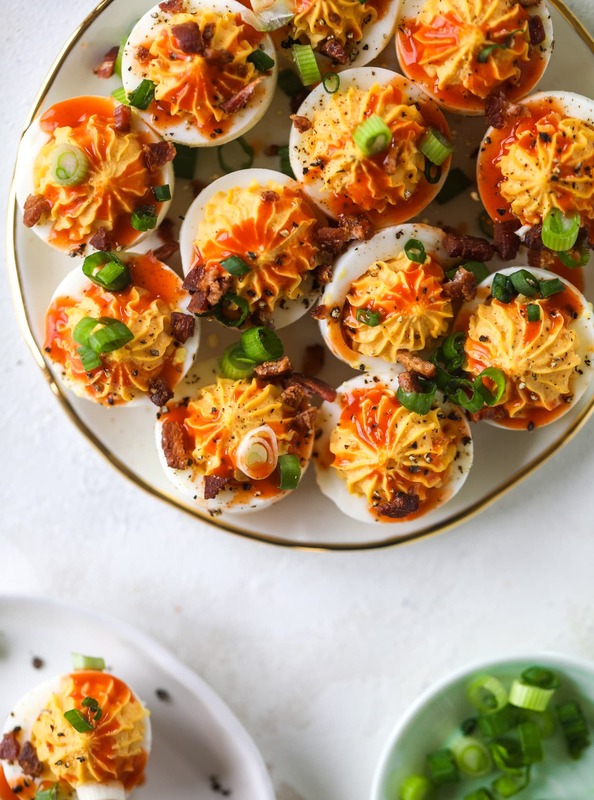 I love a good deviled egg on a holiday, as a snack at a party or even during the week for lunch. We can obviously make these year ’round too. Right? 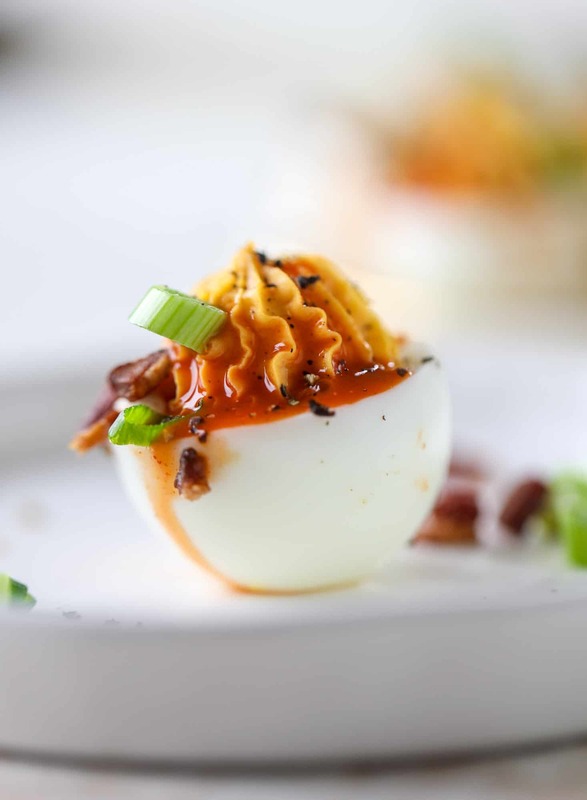 Buffalo deviled eggs are kicked-up deviled eggs! Made with goat cheese filling and served with buffalo wing sauce, crispy bacon and sliced scallions. Heat a skillet over medium-low heat and add the bacon. Cook, stirring often, until the fat is rendered and the bacon is crispy. Cover a plate with a paper towel. Remove the bacon with a slotted spoon and place it on the paper towel to drain excess grease. To boil the perfect egg, place the eggs in a large pot and fill it with cold water. Bring it to a boil and let bubble for 1 minute, then turn off the heat and cover the pot. Let the pot sit for 15 minutes. After 15 minutes, place the pot in the sink and fill it with cold water to cool the eggs down immediately. You want the eggs to sit in cold water for 20 minutes or so, so you may need to dump the water and refill with cold water a few times. You can add some ice cubes too! After 30 minutes, peel the eggs and place them on a paper towel. Slice them in half and gently remove the yolks. Add the egg yolks, mayo, yogurt, goat cheese, buffalo wing sauce, mustard, salt, pepper and garlic powder to the food processor. Blend until smooth and creamy and mousse-like. You can taste and add additional salt if needed. Scoop out the mixture and spoon it (or pipe it with a pastry bag) into the open egg whites. Drizzle the eggs with more buffalo wing sauce (as much as you’d like!) and sprinkle with the fried bacon. Top with sliced green onions. Sprinkle with freshly cracked black pepper or smoked paprika. These can be made a few hours ahead of time, but I would wait to add the bacon on top until right before serving. P.S. if you find yourself with an overwhelming amount of hard boiled eggs in the next few weeks, make this best ever egg salad. I live for it. Seriously make it every week! Oh man…these look INCREDIBLE!!! That flavor combo!!! Making this weekend!!! love that so so much!! OMG, dead. These sound incredible! It’s like all my favorite things in one bite! These are, without a doubt, the best looking deviled eggs I have ever seen! Yum! Despites the name, this is a sight of heaven! My mouth is watering!! I need to make these!! Have one question, though…hate altering the recipe, but I’m not a goat cheese fan…can I use another cheese or not use one at all?